P68C TC – Ameravia Inc. The new P68C TC was designed to respond to the needs of those pilots and operators using the aircraft in more demanding conditions in terms of airport elevation and density attitudes. Relative to the normally aspirated engine of the P68C, the P68C TC features better climb rates, more speed and increased performance. The aircraft presents numerous improvements such as a modern glass cockpit, new autopilot, new adjustable seats, a standard pilot door, sturdier main gear and brakes, and a higher maximum zero fuel weight. The redundancy of the second engine with a fuel consumption comparable to many six-cylinder single engine piston aircraft place the P68C TC is in a class of its own. Since its inception the aircraft was designed to be a twin. 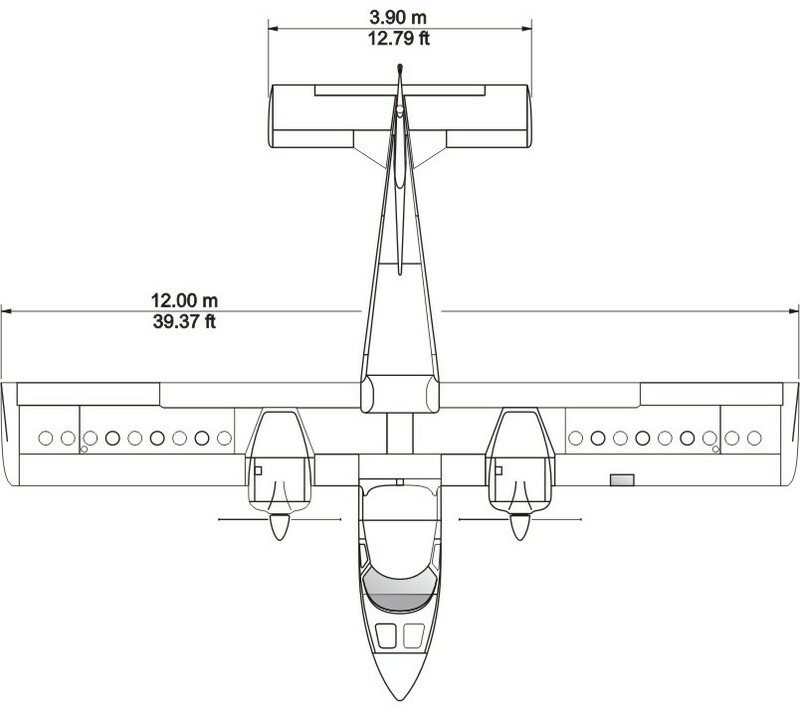 As a result, the P68 is a docile and stable aircraft in the whole flight envelope with superior flight qualities that can only be appreciated once the aircraft is flown. 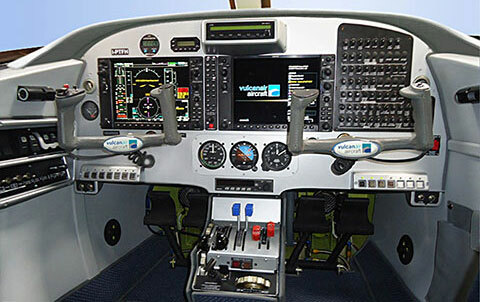 The P68C TC is the sensible alternative to many single engine and light twin aircraft in today’s General Aviation market. Luggage Capacity in Luggage Compartment 23 cu ft. The new P68C TC is easily recognizable thanks to its pilot door, longer nose with more space for avionics and weather radar and its up turned wing tips. Interviews with our extensive family of enthusiastic owners and operators have confirmed the P68C TC as an all-round performer. Private owners graduating to their first twin, experienced pilots using the aircraft both for leisure or business and operators routinely hauling passengers from and to remote locations all fly the P68C TC with the same satisfaction. 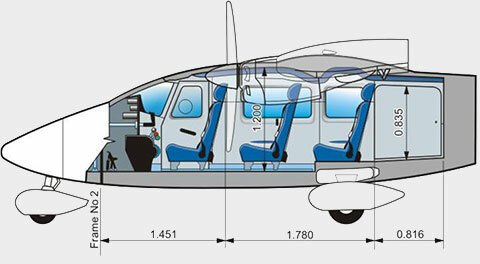 This view shows a standard 1+5 seat interior layout of P68C TC including the arrangement of the cockpit crew, passenger cabin and baggage compartment with the Front RH Pilot door, the large aft RH Cargo door and the LH Passenger entrance door. The aircraft can be also certified for 1+6 people by installing a rear bench allowing seating for three people. One new feature of the new generation P68C TC that is greatly appreciated is the redesigned interior with noticeably increased headroom especially in the aft passenger area. 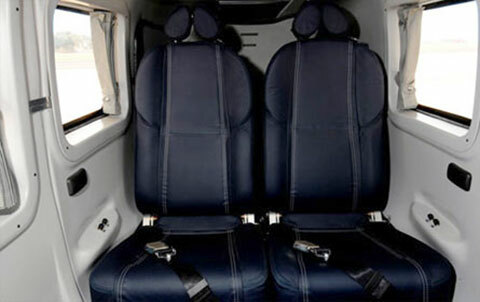 The quickly removable seats make a large cabin volume available for the carriage of goods of all kinds from mountain bikes or golf clubs to stretchers for aerial ambulance duties. If the aircraft is used for business flying, it can be easily configured in club seating just by switching the direction of two middle seats. The new P68C TC is available with two 210 hp Lycoming TIO-360-C1A6D turbocharged engines. These engines drive Hartzell constant speed, full feathering propellers. The exceptionally clean lines of the P68C TC are the result of many hours of wind tunnel testing and deliver an optimum performance in terms of maximum speed, rate of climb and endurance. With the optional de-icing equipment installed on the P68C TC has been operated day and night with safety and regularity, from severe winter conditions over the North Sea and throughout Northern Europe to the harsh environments of the continents of Africa and Australia. The P68 Series has one common feature, economy. The economy of the aircraft is the result of the low operating costs and of the low maintenance costs which are a direct result of the aircraft construction simplicity and low fuel consumption and replacement costs of its power plants. The rugged maintenance free, leaf spring fixed undercarriage, lack of complicated systems and unsurpassed accessibility of servicing points reduce maintenance to the minimum. All the OEM parts installed on the P68C TC series aircraft have been reviewed and updated to guarantee quick parts availability. With full production resumed also airframe parts availability is guaranteed. While it can be true that composite aircraft have no rivets, at Vulcanair we believe that there are many advantages in aluminum construction. The first advantage is weight, compared to a similar structure made of aircraft certified composite materials the second are the known and well-documented aging and fatigue qualities of aluminum structure together with the ease of repair. The P68C TC can truly be considered an airborne SUV. The difference between the Vulcanair and any aircraft that may be comparable to it is that the P68C has two engines and these two engines are powerful enough and reliable. No other light twin in the market offers three rows of removable seats, more than 65 cubic feet of internal volume including 20 cubic feet of cargo space allowing a max load in the cargo compartment of 400 lbs. The P68C TC flexible space allows the pilot to load the aircraft in many ways that can satisfy many different mission profiles.